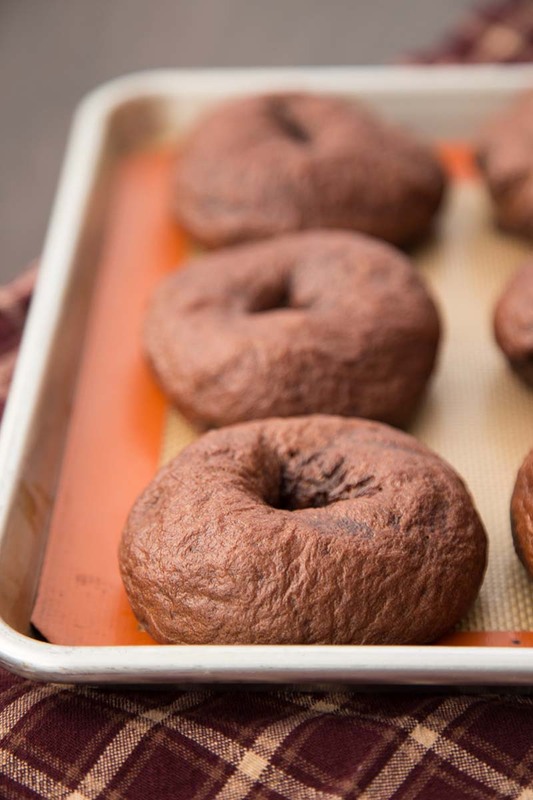 Whether you’re a chocolate lover or not, you’ll find that these cocoa sourdough bagels are the perfect addition to your breakfast menu. They are great with cream cheese, butter and jam, or some almond butter. Using the beater blade, mix on medium speed for 2 - 3 minutes, until the mixture is smooth. an additional ¼ - ½ cup of flour. Allow the dough to knead in the mixer for about 2 minutes. Transfer the dough to a lightly greased bowl and cover. Let the dough rise until it has just about doubled in size and the imprint of two fingers remains. floured surface. Divide the dough into 12 equal portions. Shape each portion into a ball and let it rest for about 10 minutes. sugar or honey to the water. Preheat the oven to 425°F. off with a clean kitchen towel or a paper towel. transfer them to a wire rack to cool completely before slicing.